Wait, what??! In Python, tuples are not created with parentheses? But just because you can doesn't mean you should. It's a better idea to get used to including the parentheses, because sometimes you do need them. On line 5, the MAGENTA tuple is created without using parentheses. By passing MAGENTA to the show_type() function, we see that MAGENTA is indeed a tuple. On line 9, the tuple (255, 0, 255) (constructed with parentheses) is passed to the show_type() function. This works fine. On line 12, the tuple (well, not really) 255, 0, 255 (constructed without parentheses) is passed to the show_type() function. In this case, Python passes the values to the show_type() function as three separate arguments. As the function only expects one argument, this results in an error: TypeError: show_type() takes 1 positional argument but 3 were given. 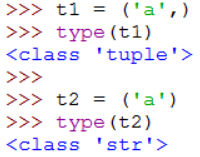 So, in a nutshell, tuples are created with commas, but you should wrap them in parentheses.